Executive Chef Tory McPhail of the award-winning Commander's Palace located in the Garden District of New Orleans, Louisiana graciously shares a tempting glimpse of the restaurant with his recipes for Bourbon Lacquered Quail, Lady Apple and Foie Gras Stuffed Quail, Bacon Braised Cabbage and Persimmon Jam with Basil Hayden Bourbon-Molasses Glaze; Creole Cream Cheese Gnocchi with Crawfish, and Grilled Wild Boar Chops with Southern Comfort Apricot Glaze. Bon Appetit! 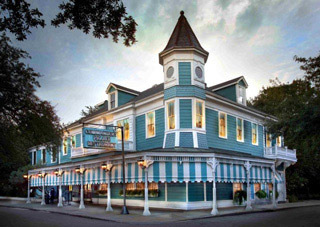 Commander's Palace describes Executive Chef Tory McPhail's culinary focus as "Modern New Orleans cooking meets haute Creole," and having dined at the restaurant many times over the years, I can readily concur. 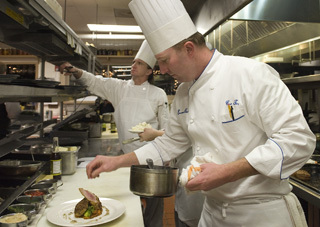 Originally from Ferndale, Washington, Chef Tory McPhail grew up on a farm eating fresh products, and honed his culinary career first in New Orleans at the age of 19, working his way up the ladder in various positions in the kitchen followed by working in Florida, London, and the Virgin Islands, before joining Commander's Palace in Las Vegas. Since early 2002, he has called New Orleans home, working as the Executive Chef at the legendary Commander's Palace, which has been a fine dining tradition since 1880, and has made an impact on the culinary scene in a city renowned for its cuisine, including winning the 2009 Great American Seafood Cookoff. Speaking with Chef Tory McPhail in July 2011 over the course of my dinner, I learned about his "dirt to plate with 100 miles" policy where he strives to use 90% of the restaurant's ingredients to come from within 100 miles, and that the restaurant grows their own herbs. Passionate and creative, when Chef Tory McPhail is not working in the kitchen creating new recipes, he is a dedicated "food traveler" and had just returned from a 10-day vacation where his focus was an oyster tasting trip sampling oysters from New Orleans all the way to St. Petersburg, Florida, stopping in all the small oyster shacks along the way and eating his way towards Florida, which he described as a most memorable trip. Method for Quail Preparation: Clip wings (save for sauce), split the quail down the back (breast should be whole), leave legs on for presentation. Season with Creole Seasoning and rub with vegetable oil. Lay skin side down on a tray or work surface. Put balls of stuffing (see Lady Apple and Foie Gras Cornbread Stuffing) on top of Quail and turn Quail upside down over the stuffing balls. Set Quail on a sheet tray. Cook at 375 ° F for about 18 minutes, until internal temperature of stuffing is 145 ° F.
Brush Quail with bourbon-molasses glaze and return to oven for 1-2 minutes. 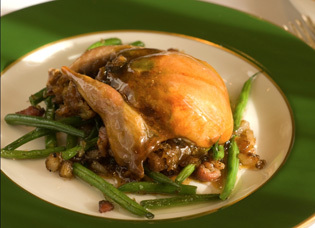 Remove Quail from oven, brush with glaze again and let rest. To Assemble: Place braised cabbage in the center of the plate. Place the quail over the cabbage and brush with glaze. Garnish the outer part of the plate with more bourbon-molasses glaze and persimmon jam. Method: Place oil in a hot braising pan and render foie gras. Toast garlic and sweat onion, pepper and celery. Season with Creole seasoning. Add apples and cook until soft. Fold in cornbread and herbs. Cool and form into four equal balls. Method: Sift dry ingredients. Whip eggs with wet ingredients, and then add diced vegetables. Fold in dry ingredients. Cook in buttered mold at 350 for 12 to 15 minutes, depending on mold. Method: Render bacon in a skillet. Add onion and cabbage. Deglaze with Gin, season with salt, pepper and a splash of cane vinegar. Cook until cabbage is tender and slightly dry. Method for the Bourbon-Molasses Glaze: Place Quail wings in a hot medium saucepot. Deglaze with bourbon to remove alcohol. Add all other ingredients. Reduce by ½. Skim to remove impurities. Pass through a chinois. Discard wings. Let cool slightly to thicken. Method for the Persimmon Jam: Boil all ingredients in a small saucepot, until persimmon is tender. Puree in a blender until smooth, strain through a chinois back into the saucepot. Reduce by ½ over low heat. Remove from heat. "Creole cream cheese combined with gnocchi, crawfish, and chanterelle mushrooms is about as decadent as it gets. We make our own Creole cream cheese, which is quite different from regular cream cheese - it is tart, and has a smoother, more liquefied texture. If you order some from our resource list, you will not regret it. Another favorite way of eating Creole cream cheese is with sugar and berries. If you cannot get Creole cream cheese, substitute sour cream or crème fraîche. When making gnocchi, you need to work fast because if the potato in the dough gets cold, it gets too starchy and sticky to work with and will not bind with the other ingredients. It becomes potato glue." Method for the Gnocchi: In a medium saucepan, cover the whole potato with salted cold water. Bring the water to a boil over medium heat and cook until tender. Drain. Hold the hot potato in your hand with a kitchen towel and peel away only the skin with a knife. Run the potato in a ricer or a food mill. Combine potatoes with 1 ¼ cups flour, butter, Creole cream cheese, salt, and pepper in a large bowl and stir with a rubber spatula for about 15 seconds until smooth and the flour is completely incorporated. Add the egg yolks and stir for 15 seconds more, being careful not to overwork the dough. Turn out the dough onto a floured work surface and cut it into eight portions. Working with one portion at a time, and rolling your hands back and forth, outward from the center to the ends, roll the dough into a long thin strand, about ½ -inch in diameter. Cut each dough strand into ½-inch pieces and sprinkle the tops lightly with flour. (Add as little flour as possible to prevent sticking.) Lift gnocchi from the work surface using the edge of a large knife or bench scraper and transfer on a baking sheet. Bring a large pot of salted water to a boil. Add all of the gnocchi to the water, stirring, and cook, undisturbed, for 3 to 3 ½ minutes, until the gnocchi start to float. Remove with a slotted spoon or strainer and place in an ice bath to stop cooking. Drain the gnocchi, transfer to a large bowl, and toss with oil. Gnocchi can be made up to 1 day ahead, covered, and chilled or frozen. Toss the gnocchi with extra vegetable oil to prevent sticking if you are making it ahead. Method for the Crawfish Sauce: Heat a large skillet over medium high heat about 1 minute. Add the butter and shallots and cook about 30 seconds until shallots are wilted. Add the crawfish, tasso, mushrooms, and Creole seasoning and cook, stirring, for 2 minutes. Add the heavy cream and bring to a simmer. Add the gnocchi and cook for 2 minutes, until gnocchi are hot and sauce is thickened slightly. Stir in the Creole cream cheese, truffle oil, and tarragon and cook for 30 seconds. Adjust seasoning as necessary. "The Potato Behind the Chef - Potatoes made Tory become a chef. When he was a child, his mom and grandmother would occupy him while they were making dinner by giving him a warm baked potato to play with. He sat at the kitchen table completely fascinated with kneading the potato in his hands and transforming it from a fluffy, crumbly potato into play dough. Everyone tells their children not to play with their food, but Tory's mom let him, and it sparked his food curiosity." "Wild boar are pretty scary beasts. As if they were not scary and fast enough, you hunt wild boar in tall grass or heavy trees and brush. You cannot see them coming, you only hear them -- hopefully! Southern Comfort would be excellent to have on hand to calm your nerves after the hunt, or to pour into this glaze." "Boar has a flavor of pork, but more intense. One end of a rack of wild boar is larger than the other end, so to ensure even cooking, cut the rack in half and cook each portion separately to the desired temperature." No boar? Substitute lamb or pork chops or any type of game. Method for the Southern Comfort Apricot Glaze: Combine 1 cup Southern Comfort, apricots, corn syrup, and red pepper flakes in a small skillet and bring to a simmer over medium heat. Simmer, stirring occasionally, for 10 minutes until large bubbles form and the mixture is thick and reduced to 1 ½ cups. Remove from the heat and stir in the remaining 2 tablespoons Southern Comfort. Prepare a medium-high fire in a grill. Method: Rub the oil into all sides of the rack and season with the Creole seasoning. Place the rack halves on the grill, fat side down, and cook over medium high heat for about 10 minutes until well browned with good grill marks and until the fat is starting to crisp (watch for flare-ups as the fat renders from the meat). Turn and cook for about 8 minutes, until an instant read thermometer inserted into the thickest part of each half registers 130 º F for medium-rare. Brush half of the glaze all over racks and grill for 30 seconds on each side. Transfer the boar to a cutting board and cover with aluminum foil to keep warm. Rest for 10 minutes. Cut between each bone and partition into separate chops. Arrange the chops decoratively on a platter and serve the remaining warm glaze on the side for dipping. *Frenching: When a rack is "frenched", it means that all meat and fat between the ends of the rib bones are trimmed off so that the roasted meat is ready for slicing at the table. Frenching is done for presentation's sake mostly, so you can avoid the step all together, or ask your butcher to do it for you. Commander's Palace serves dinner Monday through Sunday from 6:30 pm until 10:00 pm, lunch Monday through Friday from 11:30 am until 2:00 pm, and a Jazz Brunch featuring a special menu and Live New Orleans Jazz by the Joe Simon's Jazz Trio on Saturday from 11:30 am until 1:00 pm, and on Sunday from 10:30 am until 1:30 pm. Business Casual attire is acceptable, jackets preferred at dinner. No shorts or t-shirts accepted at any time. Read about Commander's Palace in the Restaurants section. Read other articles on New Orleans and Tales of the Cocktail in the Destinations, Hotels and Resorts, Restaurants, Chefs' Recipes, and Liquor Cabinet sections.